The castle town of Nihonmatsu (literally, two pine trees) and its adjacent lands were fought over and controlled by various clans such as the Aizu and Date, since the fourteenth century. Ruling daimyo changed frequently until, during the Edo period, Tokugawa leyasu put the Shirakawa family in control of the region. Remembered today in this region are the young soldiers faithful to the Tokugawa family, who defiantly fought against the southern daimyo forces that were sympathetic to the restoration of the emperor. Perhaps Nihonmatsu cabinet-makers, recalling this, sought to make tansu that would be noticed, make the city famous and thereby give voice to these youth. 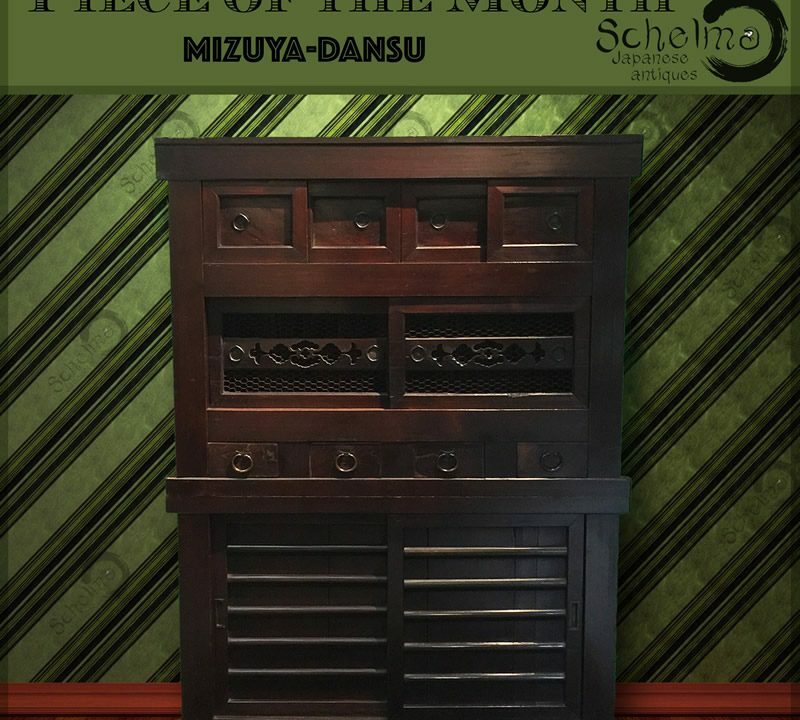 Nihonmatsu isho-dansu are some of the largest clothing chests made during the Meiji era. The scale is most notable with chests more than 105 cm wide and standing up to 120 cm high. These chests, unlike many other styles with Edo-period design precursors, are a distinct Meiji-era phenomenon. Production seems to have begun around 1880 and continued through the Taisho and early Showa era. 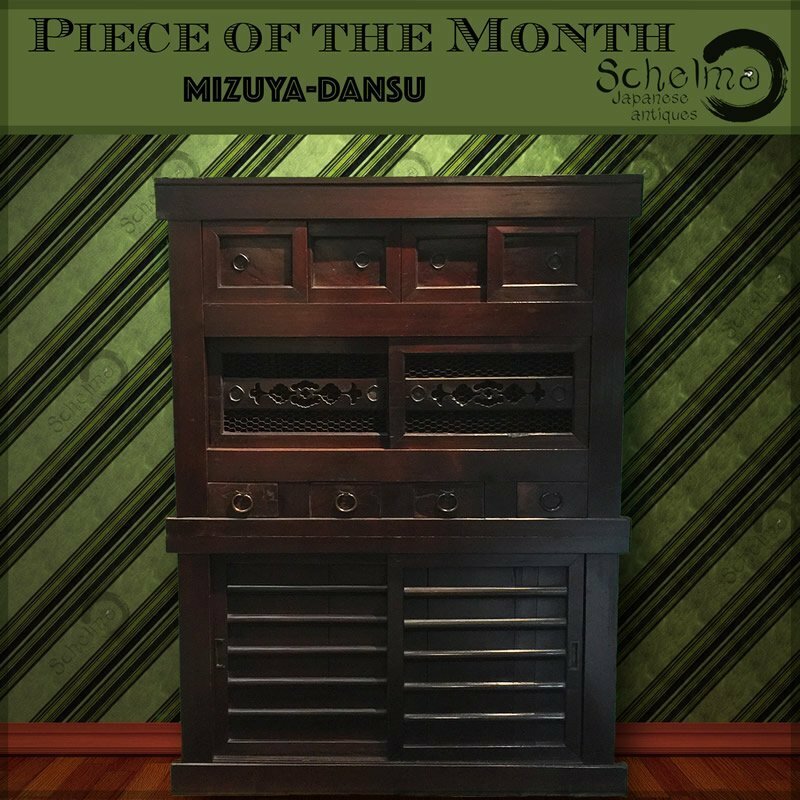 Nihonmatsu tansu are exclusively chest-on-chest designs, customarily built with sugi (cedar wood) or hinoki (cypress wood) carcases and keyaki (zekova wood) drawer fronts, and finished with wiped lacquer, kijiro, or even more opaque finishes. 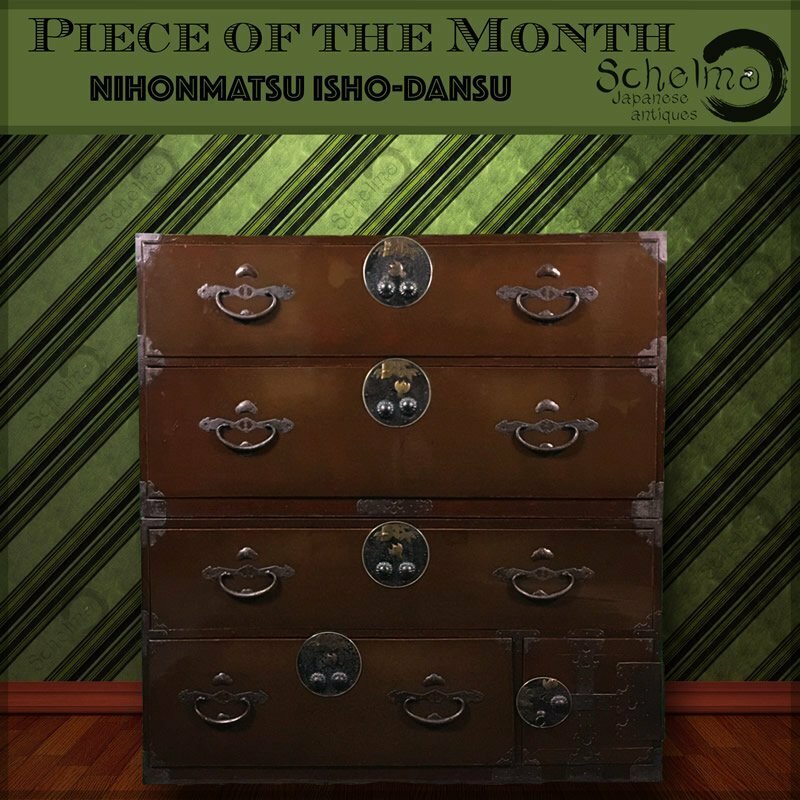 Distinctive characteristics of Nihonmatsu tansu include a round or squarish large lockplate with often brass decorative detailing and double-lock buttons. These two floriate buttons were a locking latch that required a key, and a temporary sliding latch that did not require a key. The brass or iron decorative part were often symbols of good luck, like Daikoku’s mallet or pine and crane motifs, that adorned the lockplate or acted as keyhole covers. 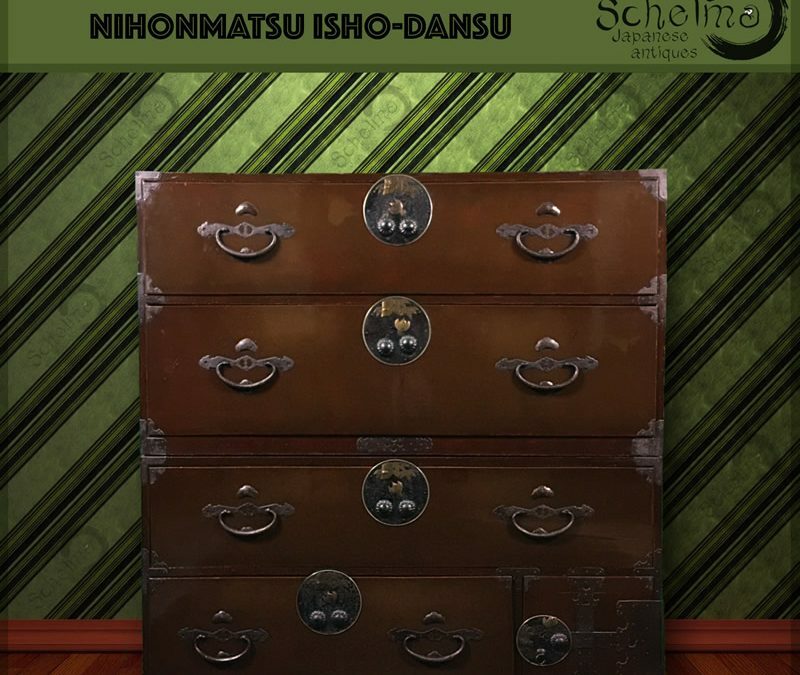 Nihonmatsu chests, like so many isho-dansu, usually had a small safe on the bottom right where owners were keeping their most precious items. The drawers handles were also very large compared to other tansu and they often had a decorative pine symbol above each handle. A reference to Nihonmatsu that means two pine trees. As Nihonmatsu tansu became very popular during the Meiji era but were also very expensive, some cheaper version were made where iron replaced the brass decorative part and sometimes they even only had one button latch. The shape and size remained the same however and they off course always have the pine symbol above their handles. A - The wood inside is usually cedar or cypress. There is a little safe door at the bottom right with a few small drawers behind to keep valuables. D - Handles on the side that are used to move quickly the tansu from the house with its precious content in case of fire, flood, etc. It also helps to keep both part of the chest together.